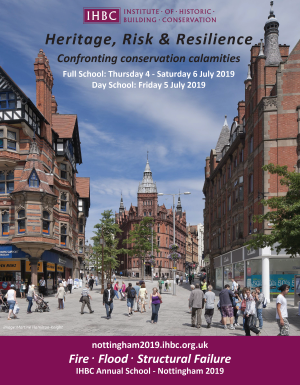 The Institute of Historic Building Conservation (IHBC) is delighted to announce Jubb Clews as the Annual Dinner Sponsor for the IHBC’s 2019 Annual School ‘Heritage, Risk & Resilience – Confronting conservation calamities’, which takes place in Nottingham, 4 -6 July, with the Annual Dinner following the AGM and Day School on Friday 5 July. IHBC Operations Director Fiona Newton said: ‘We’re delighted to be able to welcome Jubb Clews as the IHBC 2019 Annual Dinner sponsor. Jubb Clews is a new name for professional surveyors with a long track record in historic buildings conservation and valued longstanding support for the IHBC’.